In a brief flirtation with lunacy in the 1970s, the Diocese sold off this and several other churches to the highest bidders. Perhaps the parish had lost confidence in itself, or perhaps it was a well-meaning, if short-sighted, attempt to rationalise resources. I use the word 'lunacy' advisedly, for there are two reasons why some churches should never be sold off for private use, and they both apply here. Firstly, this was a significant historic building, which would certainly find itself in the care of the Churches Conservation Trust if it was abandoned today. It had a scattering of medieval glass, a brass (now at Thorndon), and a significant 17th century memorial. The gorgeous font is now at Mendlesham, as are the benches. Secondly, a medieval parish church is at the heart of an English country village. Maybe it did not seem that way back in the 1970s, when villages as small as Rishangles might still have a shop, a post office, and even a school, and something of a community life. But these have now gone, all over England, and the parish church is the one survivor, except in places like Rishangles. St Margaret was not alone; the nearby equally significant and historic churches of Mickfield and Ubbeston met the same fate. When I first came here in the 1990s it was to find St Margaret a sad sight, rundown and neglected. After its sale, this was a craft workshop for several years, and in 1999 the sign for 'Old Church Studios' survived, albeit lying decaying on the verge. Although a large sign at the entrance said private, there was no gate, and I walked into the graveyard. This was fairly neglected, but some graves had been cared for very recently; perhaps there was a local sigh of relief when the gate came down. The building appeared in a bit of a state, but scaffolding surrounded the tower, and the bell openings were being replaced by what appeared to be French windows, as if a penthouse apartment was being installed up there. Thirty years ago, there were four medieval bells. I wonder what happened to them. A wire fence surrounded the building, the usual paraphernalia of a building site scattered around it. It was pouring with rain by now, and I didn't have the heart to investigate much further. To be honest, it was all a bit grim. And grim reading is the entry made for Rishangles parish church at the time of the 1851 Census of Religious Worship. 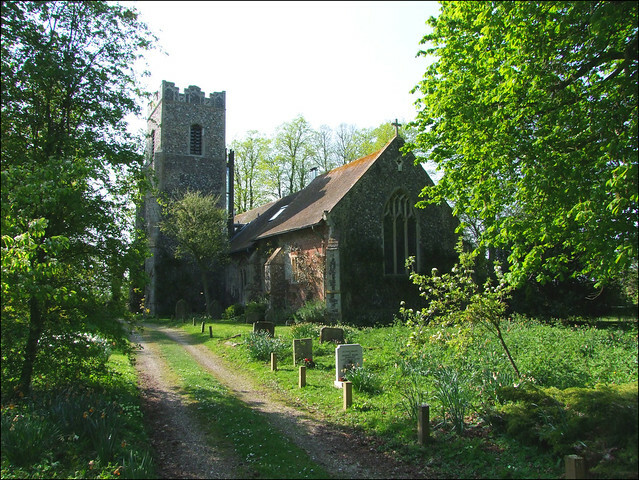 Out of a parish population of 279, a mere 22 had attended the morning service, barely one in thirteen, and one of the lowest attendances in Suffolk. This was a strongly non-conformist village, and the Baptist church directly across road played host to 180 people that morning, and almost 220 in the afternoon. The Reverend Hyam Burn, the recently appointed Rector of St Margaret, must have wondered what he had taken on. He moaned that many children are employed on Sunday frequently in protecting seeds sown in fields at usual seasons of the year, although you can't help thinking that if this were true of Rishangles it would have been equally true of almost anywhere in Suffolk. He pointed out that when he had been inducted in 1849 the church was then not so well attended as now and there was no church Sunday School. He complained that there were two Dissenting places of worship in the parish filled chiefly by out-parishioners, although again, if this were true you can't help wondering where the residents of Rishangles were going. A daily school would be a great boon, he finished, rather wistfully. However, contemporary observers noted that there was a bitter animosity towards the Church of England in Rishangles and its neighbouring villages, and that very few and far between were poorer families who were not active dissenters. It sounds a fascinating story. Coming back in 2011, it was with some trepidation that I once again cycled up the village street towards the gap in the hedge; but the private sign had gone, and so had the signs of neglect. The graveyard seemed well-kept and well-visited, and the church building itself appeared in good shape, if a little overgrown: a curious glass structure to the north of the tower looks like a spiral staircase, but I think is just intended to let light in. The building has been converted into holiday cottages, with four bedrooms sleeping up to ten people. There are a number of photographs of the interior on the internet which shows that it is well-kept inside, and much of the original integrity survives, which is good news. Meanwhile, across the road, the Baptist church expanded its premises greatly in the 1980s, with a fine modern extension to the 19th century chapel. It is rightly thriving, directly in the face of its moribund medieval predecessor. The Reverend Hyam Burn's pessimism was well-founded.